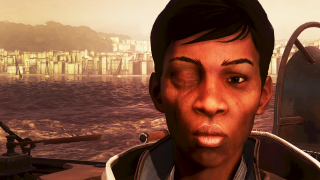 The many faces of Dishonored's exotic new setting. The first location you visit in Karnaca is the Campo Seta Dockyards. This is a neutral zone, meaning you can move around without having to worry about being hassled by the Duke’s guards. Your mission is to find a rail car heading the Addermire Institute, but it’s worth taking some time to explore the streets first. The docks are bustling with people, and talking to them is a great way to learn about this strange new country. As I was doing this, I noticed how incredible the characters look. And not just the main cast, but random people on the street too. The stylised art in the first game was wonderfully distinctive, but the sequel has taken it to the next level. The faces still look hand-sculpted, almost like caricatures, but they’re now rendered with an extra layer of beautifully grotesque detail. The rough, weathered faces of Karnaca’s citizens, from dockers to aristocrats, reflect the ugly world they live in and the ugliness of their lives. To create these portraits I used Ansel, Nvidia’s new screenshot tool. If you have a supported GPU you can access it by pressing ALT+F2 in-game. Sometimes you get a black screen, but restarting the game seems to fix it. And it’s only when I started zooming in with this that I realised just how obscenely detailed the faces in the game are. The realistic skin shaders lend the exaggerated features a tangible texture, but it doesn’t send them tumbling into the uncanny valley. These characters will still look great in ten years, because Arkane understands that strong art always trumps photorealism. Before the artists render a model in 3D, they use concept art as the basis for a clay sculpture. This unusual system is what gives the faces that unique hand-crafted look. 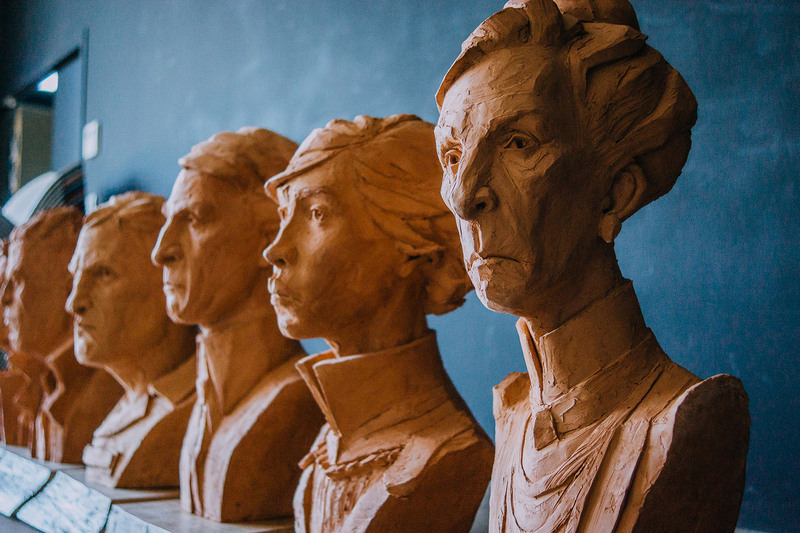 “Clay sculpting allows the artists to set the look and anatomy of a subject after the 2D concept and before the 3D modelling,” says Mitton. “This saves time for the 3D modellers and helps unify the look of the characters.” The time-saving point is interesting, explaining how Arkane are able to give even the most generic NPC an interesting face. Interestingly, one of the only characters in Dishonored whose face isn’t scarred or gnarled in some way is The Outsider, the supernatural being who grants Corvo and Emily their powers. I interviewed creative director Harvey Smith recently about the making of Lady Boyle’s Last Party, which you can read in this issue, and he suggested this was intentional. Perhaps to highlight his other-worldliness. It’s attention to detail like this that makes Dishonored’s world, and the people who live in it, so compelling. Dishonored 2 is a remarkable artistic achievement. Karnaca is entirely fictional, but feels like a real place with its own rich culture and history. From the architecture to individual props like typewriters and lamps, everything has been carefully, lovingly designed to feel like it has a place and a use in the world. And this obsession with the small details extends to the people who live there, whose storied, weather-beaten faces are as important a part of Arkane’s exquisite world-building as anything else.